I initially jumped into this game expecting a throwback to one of my favorite tactics RPGs for the Game Boy Advance (Namely Final Fantasy Tactics Advance), but I had to put my foot down on the proverbial brake pedal before the eagerness swept me over. In fact, it wasn’t so much my foot but a thick boulder hurled at me by the Rime Berta itself. There is no doubt in my mind that this game makes an attempt to recycle tools and development approaches from the previously mentioned title, since there is hardly enough reasons to make key distinctions between the two. Our role in the game is to direct our party to victory versus a team of A.I. controlled enemies in order to advance through each stage of an area so we can move into the next. Each area consists of several stages with the last one facing us off against a boss before we can move on. Our protagonist is a young girl looking for the “hallows”, a McGuffin with the fabled ability to grant wishes. The character’s ambition is to use this power in order to cure her people of a mysterious affliction, so she braves a dangerous tower full of malicious things and faces off against its Guardians in order to reach her goal. Now here’s the clever twist: The malicious things are in fact puppets based off the Japanese norm for cute. Let that sink in for a moment. If you’re done using your imagination, let me be the first to show and tell. Our main character does not fight, and instead commands these cute puppets to do the battling in her stead. These puppets serve as our units in battle, each with their own class, and are all little girls dressed up for either a cosplay or Halloween costume party, and for a bit of flavor counting, here are the top three I’ve observed: The Warriors, who are cat-girls in a schoolgirl outfits brandishing swords; the Archers, cute little garbed elves; and the Guides, fairy-themed battlers who are experts at… hitting others with flowers. Smell the sweet fragrance of defeat, I guess? 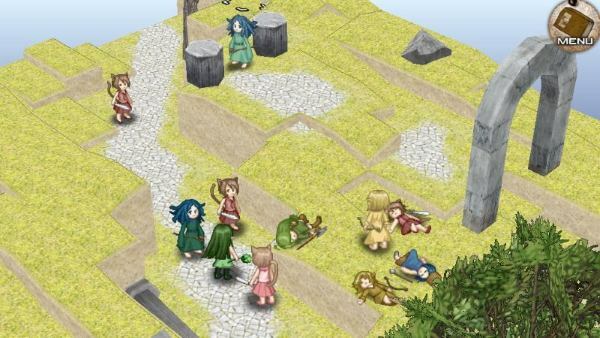 Rime Berta is a tactics RPG with a light hearted story and a linear game world where you can’t expect much more than a few graphical additions (like a tree or a fallen piece of debris) with each subsequent battlefield you visit. 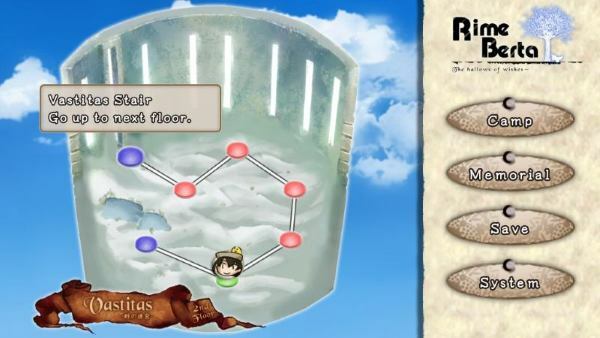 These battlefields are accessed via an over-world map that represents each area in facsimile of a table-top game; with each circle being a stage. My experience during the first area let me see how poorly interconnected the gameplay and the story are, where one lags behind the other and inter-missions are the only time when you get to see the main character open her mouth. As a result of recycled visuals and a monotonous style of gameplay, and a bunch of characters I felt no attachment to, I quickly decided I would leave behind any notion of story analysis and focus on just playing. And play I did. I called this game out earlier to be heavily based off FFTA to the point there was no distinction between the two, but I was being unfair to FFTA I’m afraid. 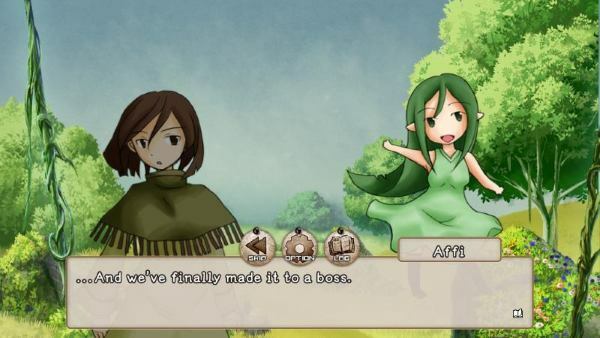 Rime Berta, for being the small game it is, lacks the abundance of features (like constant character development and short breaks from battles) the former did by virtue of coming from a larger studio and this hurts it. At no point will I try to sway anyone into thinking Rime Berta deserves to have its name dragged through the mud (I will explain in a bit), but I think I’m being fair when I ascertain that constant battling and grinding with hardly any interaction between characters or at least a little lore (a STORY if you will) quickly degrades the experience and gives the title no presence at all; when I said this hurts it, I meant it gives the game no individuality, nothing to set it apart from others, and therefore becomes heavily subjected to seemingly unfair comparisons. The game does show to have effort, I can’t deny that. After hours of playing and ignoring an overwhelming need to Alt+F4 each time I saw the Warrior class in relationship to her appearance, I found myself lightly enjoying what my mind could only describe as little girls playing with Japanese versions of a Barbie-doll army. The thought still haunts me. But let’s return to the gameplay, because it is, for all of the things I could complain about, a solid, if reused concept. Our party may consist of up to 5 units whose positions we can rearrange and whose skills we can manually assign (if they have learned them). The Camp menu lets us do that, as well as check if our characters can change classes (by fulfilling certain conditions) as well as using a somewhat unique feature called Unit Fusion (Shin Megami Tensei’s been doing it ever since… ever) where we can combine two units to make a stronger one (losing one of the components in the process). We can also check our Achievements (represented by medals), which would add extra replay value to missions if it wasn’t like replaying PC Chess against a Novice A.I. player. The class system is correctly fleshed out in my opinion, even if I do not personally agree with the art style, with several skills to learn, passive (S) abilities to equip as well as reaction (R) abilities you can capitalize on during battle. Status effects and buffs can happen, but the lack of a tutorial (you’re practically thrown into battle a few minutes into the game) to show you the basics you’re pretty much put down to figure most if not everything out by yourself. At least it's simple to do that. It’s a short and over-simplified game for what it’s worth. Rime Berta has no shops, no items, no side-quests and absolutely no worthwhile content to hold you over for longer than perhaps 30 to 40 minutes per sitting. Every battle is the same as the last, without any note-worthy special conditions to fulfill nor any other tactical requirement besides flower-punching everything down your way and spamming heals; the addition of new classes as you advance merely made me question when and if I was ever going to see a Japanese Ken figure pop up and do a Tuxedo Mask impression or something. But alas, males don’t seem to hold much weight in this fairy tale. I liked the music. There isn’t a great amount of variety, but what I did hear showed to me that the composer put some soul into the beats and the folkloric playing out during battles at least added a semblance of ambient to an otherwise barren experience. Japanese voice-overs give the game a certain amount of charm, but sadly, like I said, there isn’t a lot to invest in listening to it. I’m torn with my opinion over the art style. One the one hand, I realize the light-hearted tale demands a certain childish air about it, but on the other, couldn’t they have done a bit better than kiddy-doodles for the character art? I dunno, I’m not one with a lot of artistic sense, but with everything coupled together I almost felt like this Young-Girl Doll Edition of a tactics RPG might not be my cup of tea. For $20 this one is a must buy, and hopefully you heed my advice because there is a lot of fun to be had with this title.